We know that breakfast is important. Get it right and it sets us up for the day. Get it wrong and it turns into a nutrient deficient sugar-bomb. 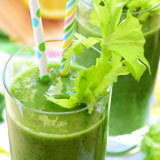 An easy way to get it right is with a weight loss breakfast smoothie. Don’t let the title “weight loss” fool you. 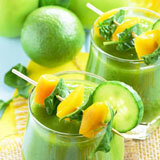 These smoothies are no lightweights. They are filling and fortifying enough to get you through till lunch without the need to snack. This is their secret. Filled with fruits, vegetables, healthy fats, proteins and grains they are essentially a complete meal, designed to keep the hunger pangs at bay. Most of us wouldn’t normally include all of these foods into a breakfast. Let’s face it, a slice of toast, bowl of cereal or a coffee is the usual breakfast go-to. 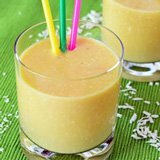 But these breakfast smoothies are designed for weight loss. Who knew it was possible to cram so much into one glass? They are not only filling, but healthy and nutritious. Should you soak your oats before adding them to your smoothies? Soaking helps to soften the hard coating making them easier to blend. But it’s not absolutely necessary. If you don’t get the chance to soak your oats in advance and are in a hurry, add the oats to your blender without any liquid, then blend for about 30 seconds. This pulverizes them to a powder and makes for a much smoother drink. 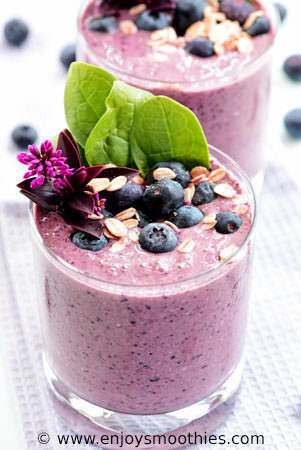 Blend together the frozen blueberries, cherries, romaine lettuce, rolled oats, Greek yogurt, almond milk, cinnamon and vanilla extract until smooth and creamy. 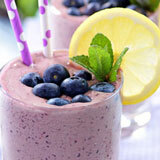 Pour into two glasses, top with fresh blueberries and enjoy. 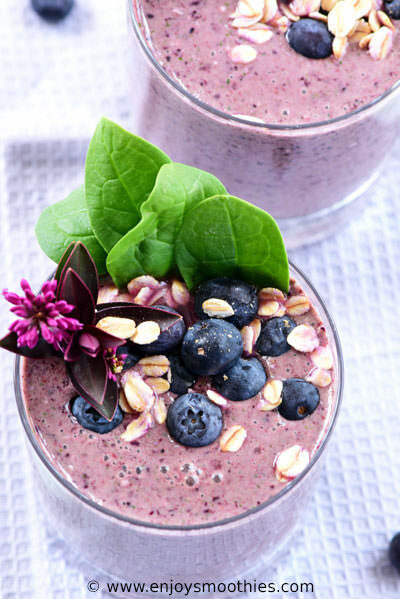 Whizz together the frozen strawberries, raspberries, blackberries, blueberries, banana, avocado, oatmeal, almond milk and honey until thick and creamy. Pour into your favorite glasses, top with extra fruit. 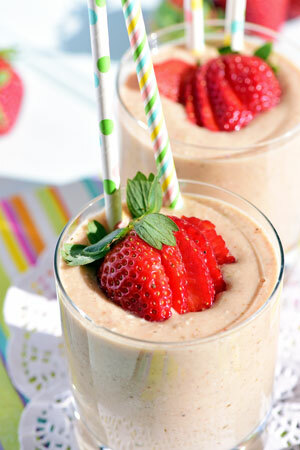 Place the mango chunks, pear, frozen strawberries, almond milk, oatmeal, almond butter, honey and ground cinnamon into your blender. Whizz on high until smooth and creamy. Serve topped with fresh strawberries. Serves two. 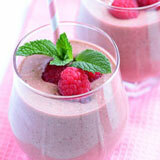 Add the rolled oats to your blender and pulse until pulverized. 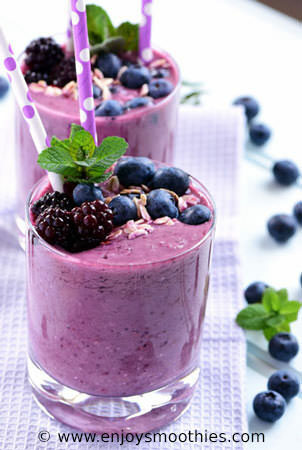 Then add the frozen blackberries, apple, banana, almond milk and lemon juice. Continue blending until all ingredients are combined. 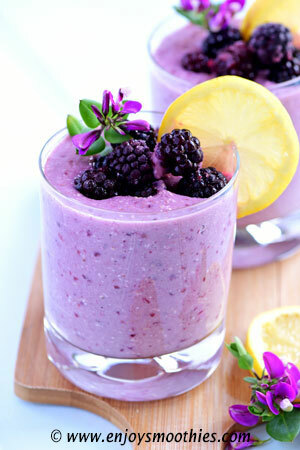 Pour into serving glasses, top with lemon slices and blackberries and enjoy.